This set of photos was taken on Sunday, October 22, 2017 at 10:03 AM. 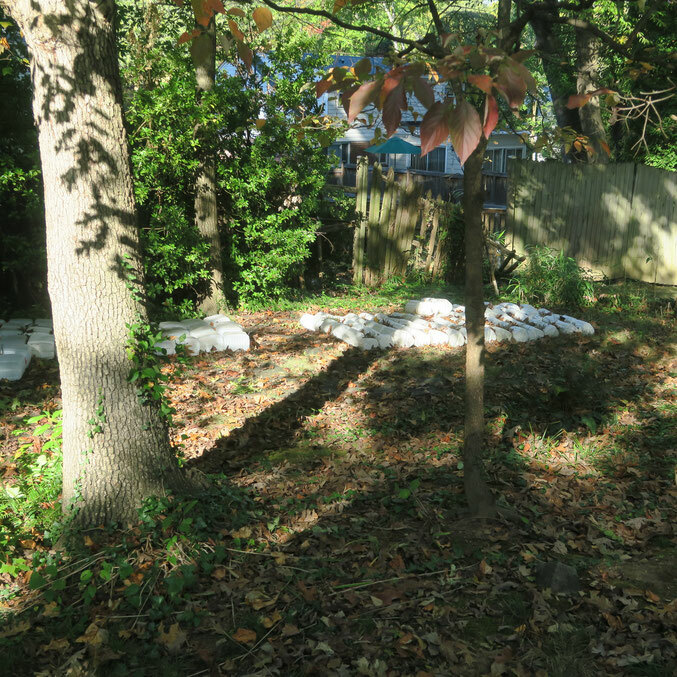 The location was in the back yard of my home in Bethesda, Maryland. The "Take It!" came as I took a short break from watching my favorite TV show "Sunday Morning" shown on CBS. It was early enough in the morning to still have the sun provide intense light, at an angle, which can produce excellent shadows. With there being a rare time in the TV program that did not interest me, I grabbed my camera and headed out, on to my back deck. 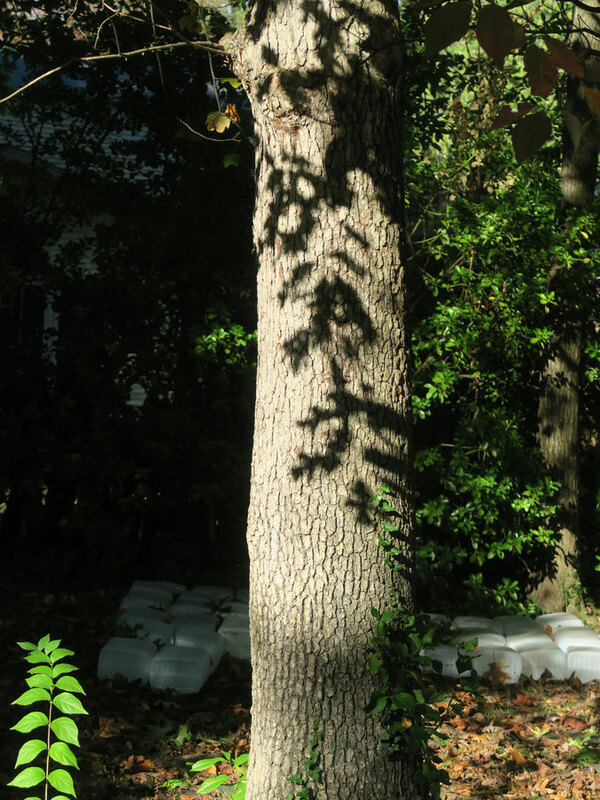 Greeting me was a shadow casting of oak leaves upon the trunk of origin. Their placement gave them an almost painted on appearance. I took several photos from the height of the deck, then moved off the deck to be on level with the tree for a little different prospective. I found my reward for this easily made move, later, while reviewing the photo series to formulate this explanation. Each of the photos posted I am happy with. However, it is the last one that spoke the loudest to me. In the shadow of leaves cast from the smaller tree to the right of the large original subject, It almost looks like one is looking at wings, spread on either side of its narrow trunk. The message that seems to be arriving is that I am healing enough to have my mind take on the viewing of the outside, and step away from the consuming attention one gives while they mend broken parts of themselves. It is as if I am finding my creative wings again. For this, I am profoundly grateful. The unwanted sabbatical leave has served several purposes, none the least of which, is almost generic in nature: The opportunity to refocus. Thank you, to everyone for your patience as I make my way back to an even more full range of motion. What are those white things on the ground? It looks like styrofoam or something like that. That's what immediately caught my attention. Glad you're doing better. Looking forward to seeing where your creative wings take you. My first thought was it looks like something you would see as a Kinkade painting. We are glad to read you're using your newfound energy to bring us some great photographs. I dig the pics but i gotta ask whats the deal with the tubs in the dirt You making a snow look a like or something?? You have a lot of green in your backyard still for a November. There must be a lot of tree cover in your backyard, the ground is covered in leaves, yet it looks like there are still plenty on the trees. Our children would love your backyard. 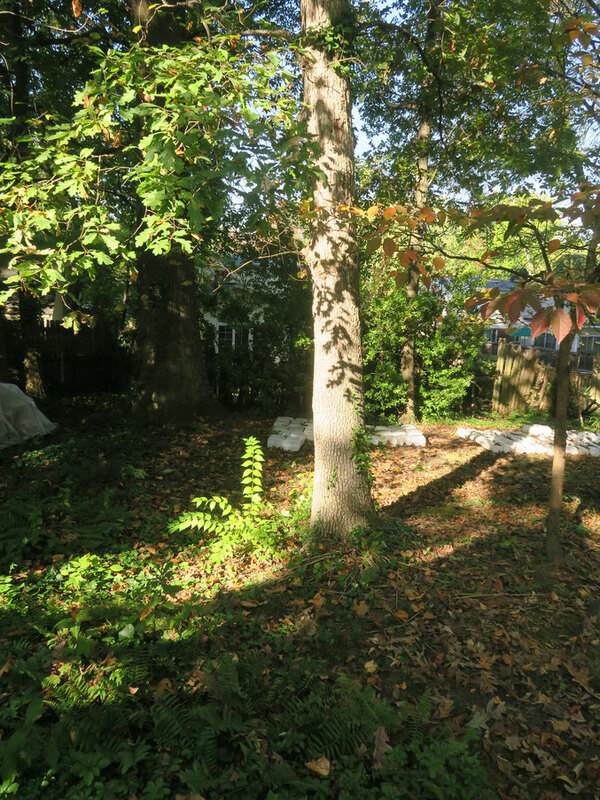 Our lot is rather small, the entire neighborhood has houses stacked one after another so there isn't much "play" room in the back or front yard. The big tree shadow almost looks like a clock at 1 or 2 o'clock.